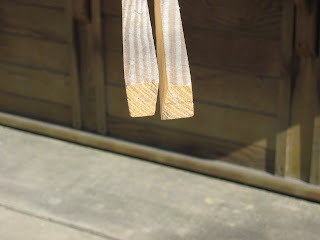 Here's a pic of my chine ends, the bevel came out well. The cut is even down the entire length. Much better than the first try. I decided to cut the chines on a table saw even though I had read in in a wood working forum that ripping a 16' piece of wood on a table saw is not a good practice. I put the table saw on the driveway and set up boxes and boards that would support the the 16' feet of floppy lumber while it fed into and came out of the table saw. I rehearsed the feed through the turned off saw a few times and adjusted the support track to give a nice smooth entrance and exit to the saw. The support system is what really made it work and allowed me to make the cut easily. I wish I took a picture of that, looked kinda funny 32' feet of crap out in the driveway with a table saw in the middle.